Bedtime still applies, even when you're about to meet the President of the United States. 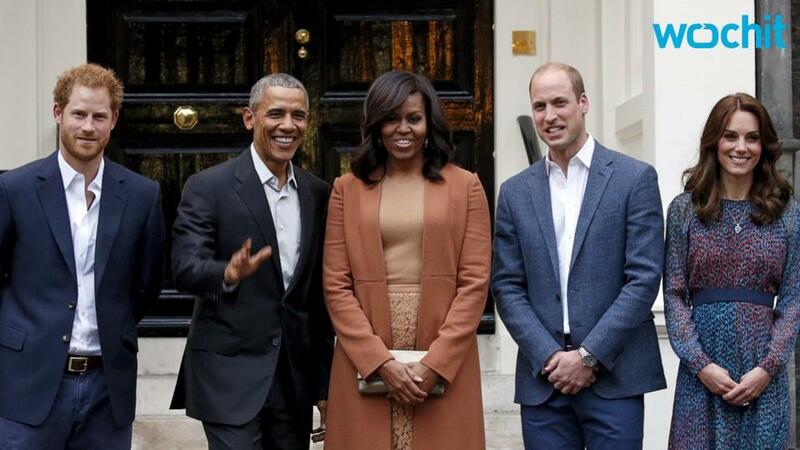 Prince George got a special meet-and-greet with President Obama and First Lady Michelle Obama at Kensington Palace on Friday and since it was close to his bedtime, he sported a checkered blue set of pajamas, a bathrobe, and black royal slippers for his big introduction. Prince George was shown in several intimate photos released by Kensington Palace greeting POTUS and FLOTUS after they stopped by the private residence to chat with his parents, Prince William and Kate Middleton ahead of the state dinner. The Obamas, who gifted Prince George with a rocking horse when he was first born, got a chance to see the tiny tot in action on their special gift. The 2-year-old royal thanked the Obamas for their gift with a firm handshake and a knowing smile before he hopped on his pony and showed off his riding skills. In the photo, Kate can be seen clapping for George while POTUS got down on his level to cheer George on. Talk about getting the "royal treatment." The President and First Lady definitely seemed charmed by the mini-prince. And who wouldn't be? It's not every day that you get to meet a future king in nothing but his blue-checkered PJs.